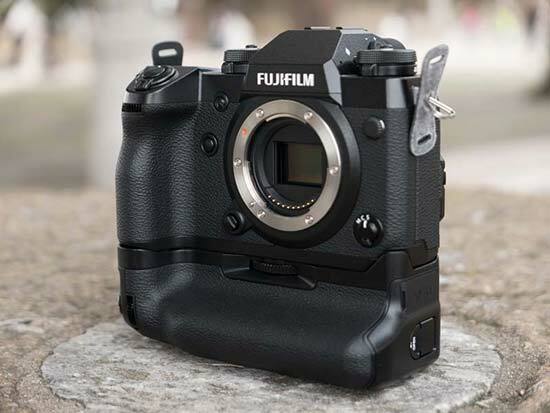 The Fujifilm X-H1 is the brand new flagship compact system camera in the popular X series, positioned above the existing X-T2 and X-Pro2 models, and is designed for professional photographers and videographers, offering the "highest performance for professionals". It features the same 24.3 megapixel APS-C size X-Trans CMOS III image sensor and X-Processor Pro image processing engine as those two cameras, but adds 5-axis in-body image stabilization (IBIS), making it the first ever X-series camera to do so. This has resulted in the X-H1 being physically bigger and heavier (over 100g) than the X-T2, but provides 5 stops of compensation when used with the majority of XF lenses (5.5 stops with the XF 35mm f/1.4 lens) and 3 stops with XC lenses. This excludes three XF lenses - the XF 10-24mm F4 R OIS, XF 18-55mm F2.8-4 R LM OIS and the XF 55-200mm F3.5-4.8 R LM OIS - which offer 2.5, 3.5 and 4.5 stops of compensation respectively. 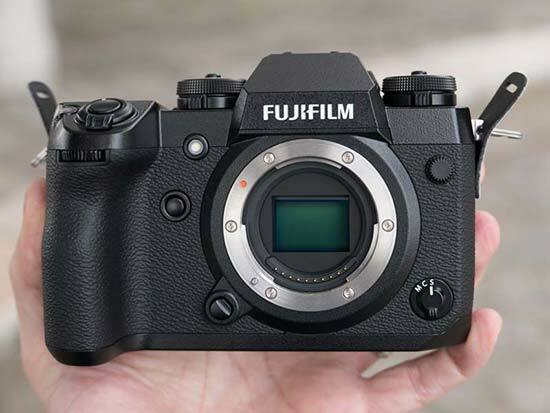 Other new features on the Fuji XH1 include a flicker reduction mode, a la Canon, a more robust and durable body, a 1.28-inch monochrome LCD screen on the top of the camera (just like the GFX 50S medium-format camera), the quietest shutter sound of all cameras in the X series, a shock free shutter release, new GFX-like handgrip, major improvements to the AF algorithm, a new AF-ON button on the rear for back-button focusing, and Bluetooth LE connectivity. On the video side, there's a new Eterna film simulation which emulates cinematic film, a DCI 4K shooting mode (4096×2160), a high bit rate of 200 Mbps, F-log (8-bit) SD card recording, a 1080/120P high-speed mode, a new higher quality built-in microphone (24bit/48khz) and timecode support. At first glance the Fujifilm X-H1 looks like a cross between the X-T2 and GFX 50S cameras, and in practice it handles a lot like that too. The XH1 is a serious bit of kit, especially with the VPB-XH1 grip attached, being physically larger and heavier than the X-T2, and tougher too thanks to a newly reinforced body with a ribbed frame that's 25% thicker than the X-T2. It's also weather sealed with 94 points, freeze-proof down to -10 degrees, has a larger heat-sink plate, and a more durable top coating than previous X series cameras. While some will question the increase in size, it has resulted in a camera that handles really well, with a larger grip offering more support, a dedicated AF-On button for back-button focusing, a useful top LCD screen for quickly checking the camera's key settings, and of course the star of the show, the 5-axis in-body image stabilisation system, which suddenly adds up to 5 stops of compensation to virtually all XF and XC lenses. 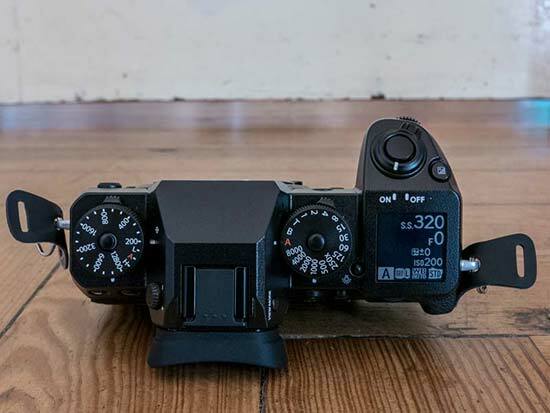 This is a Big Deal, and a big departure for Fujifilm mirrorless cameras, which up until this point have never featured in-body stabilisation, relying instead on certain lenses offering this feature. In addition to 3 axis acceleration and gyro sensors, the X-H1 is also the only mirrorless camera to have a dual dedicated processor for even faster and more precise effective stabilisation, performing approx 10,000 calculations per second. The X-H1 offers the same continuous shooting speeds as the X-T2 - 14fps with the electronic shutter, 8fps with the mechanical shutter, and 11fps with the mechanical shutter and the VPB-XH1 grip fitted. It does additionally have a flicker reduction mode, which provides stable exposure during burst shooting even under fluorescent and mercury lighting, important when shooting sports indoors. Continuous shooting is capped at 7fps with the electronic front curtain shutter and 5.5fps with the mechanical shutter when using this mode. 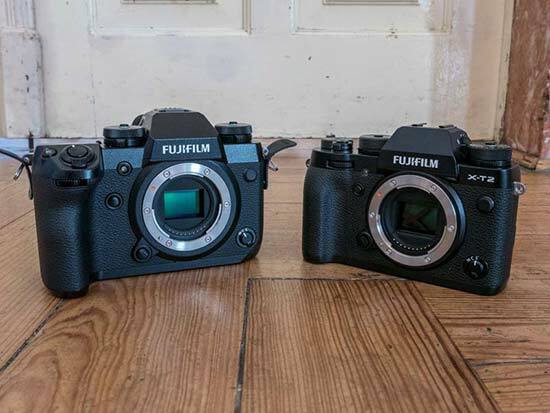 The auto-focusing system in the Fujifilm X-H1 has been further improved. The camera's phase detection autofocus system now operates down to -1.0EV, can be used at an aperture of F/11 (important when using the 2x teleconverter with certain lenses), and performs more reliably when zooming. All of these improvements work for single point AF and Zone AF and apply to both stills and video. It's also the quietest X-series camera thanks to the new shutter release sound. I found that the extra damping added to the shutter release and the barely audible click did take some getting used to, with a few mistaken shots, but I quickly grew to really appreciate it after an hour or so of use. Check out our hands-on gallery of photos of the Fujifilm X-H1 camera. For stills, the Fujifilm X-H1 employs exactly the same 24 megapixel APS-C sensor as its older siblings, the X-T2 and X-Pro2, and the same X-Processor Pro processor too, so image quality should be on par with those cameras. 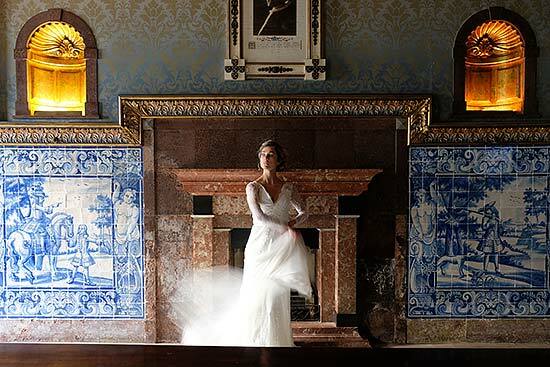 We've already shot an extensive gallery of indoor and outdoor photos with the X-H1, which you can check out here. Most of the improvements have been made to the X-H1's video recording capabilities, which can now record DCI 4K movies (4096×2160 pixels) at 24fps for up to 15 minutes, and the new ability to record a high bit rate of 200 Mbps. The Eterna film simulation is designed to minimise colour grading in post-production, offering a classic cinema look for straight out of the camera movies. With the new VPB-XH1 Vertical Power Booster Grip attached, movie recording time is extended up to approx. 30min. in both 4K and Full HD modes. The VPB-XH1 is also equipped with a headphone socket for monitoring sound while recording video. 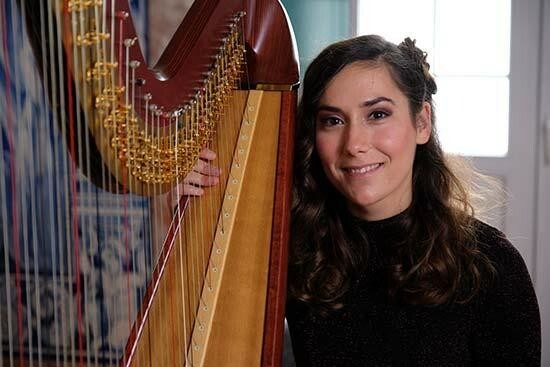 Take a look at some sample JPEG and Raw images and movies taken with the Fujifilm X-H1 camera. The Fujifilm X-H1 represents another step forward in the evolution of the popular X series of mirrorless cameras. It isn't a dedicated video camera like the Panasonic GH5s, or a dedicated sports camera like the Sony A9, but a more well-rounded proposition that's the most well-specced, professional-feeling X-series camera to date. It is also the biggest and heaviest, but then you've always got the option of the smaller X-T2 and X-Pro2 cameras (and even the X-T20) if size is a priority. Overall, we're seriously impressed with the serious Fujifiilm XH-1 and can't wait to review it in full.